April 18, 1924 was a Friday. At 7:30 in the evening, a passerby noticed smoke coming from Curran Hall, a massive four-story brick building at 1363 South Blue Island Avenue. The man ran to the corner fire-alarm box and pulled the lever. Two miles to the west, at Engine Company #107, fireman Francis Leavy was washing a window. The call came in and Leavy rushed out with the rest of the company. He told the captain he’d finish the window when they got back. Five squads converged on Curran Hall. The blaze seemed to be minor. The firemen were getting it under control when one of the outer walls began buckling. Then it collapsed, trapping eight men. The falling wall knocked out electrical power at the site. 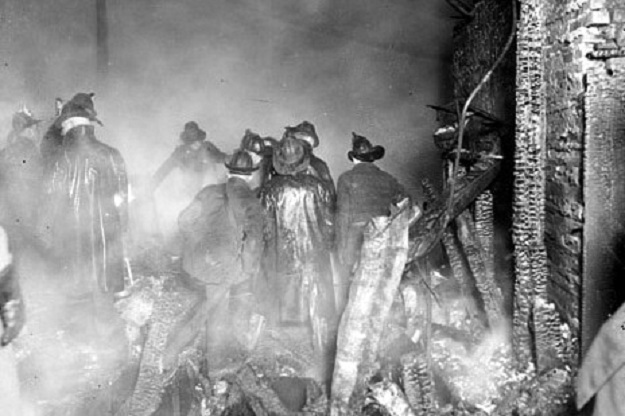 Portable lighting was brought in, while firemen combed the wreckage for their comrades. But all eight men had been killed. Among the dead was Francis Leavy. It was later determined that Curran Hall had been deliberately torched for the insurance. The building owners were tried and convicted of the crime. The day after the fire, one of the men at Engine Company #107 noticed the window that Leavy had left half-washed. In the middle of the window was a handprint. The man tried scrubbing it out, but the handprint stayed. From that time forward, so the legend goes, every fireman assigned to Engine Company #107 attempted to remove the handprint. They used water, soap, ammonia and acid; they scraped it with razor blades. Nothing worked. The Pittsburgh Plate Glass Company was called in. My dad was a glazier at PPG, though years later. The way he heard the story, PPG applied their strongest chemical solvents to the handprint–and still couldn’t remove it. 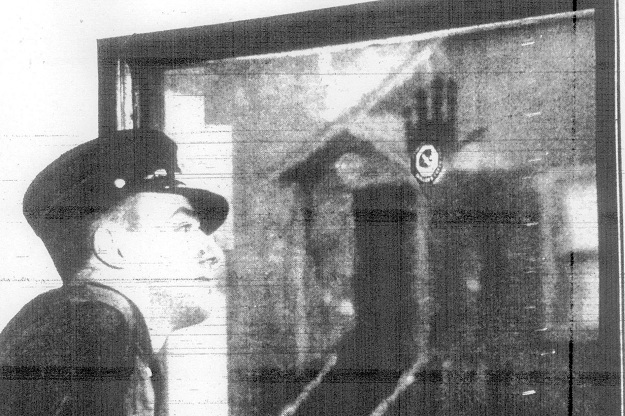 Was the handprint a ghostly souvenir of the dead fireman? It’s said that Leavy’s thumbprint was obtained from his personnel records, and compared with the print on the window. They matched perfectly. The end of the tale is prosaic. A newsboy threw a paper through the window and broke it. Most accounts say this happened in 1946. But one version claims that the window was broken on April 18, 1944 – 20 years to the day of Francis Leavy’s death.